On the 25th June 1941, Pilot Officer Neville Duke, flying as wingman to Flight Lt Allan Wright, claims his first victory, a Bf109F, over the French coast near Dunkirk. A large, dramatic pencil drawing which was the original for one of the companion prints to Nicolas Trudgian's 2008 'Aviation Sketchbook'. 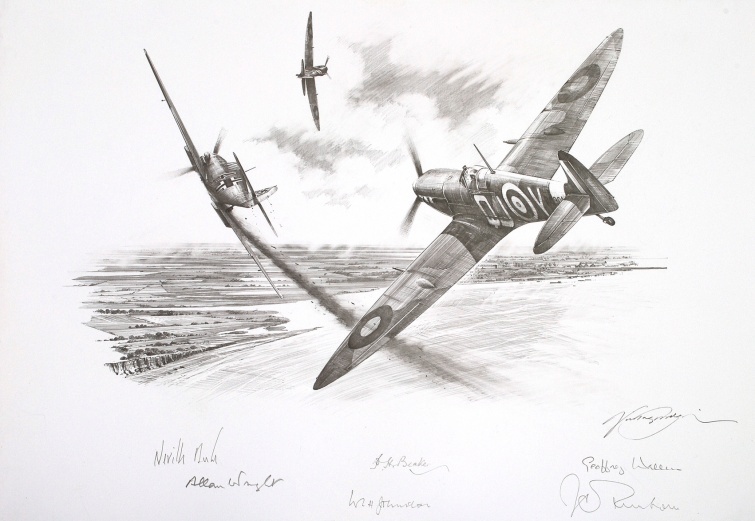 Signed by six famous pilots, including no fewer than five from the renowned 92 Squadron.